It’s too soon in the development of SFPark to draw any conclusions about the effectiveness of demand-responsive pricing on parking habits, says the SFMTA’s Jay Primus, who manages the SFPark program. Primus responded in the comments and spoke with Streetsblog to address points raised by Perkins and other readers. “The ‘expectations’ that Michael wrote of are his own,” Primus said. It’s also worth pointing out that Perkins’ post didn’t include any specific data or sources that support his assertion. It is premature to make conclusions about the effectiveness of demand-responsive pricing for parking. Before evaluating its effectiveness, people need time to become aware of rate differences between blocks, time of day, and/or between on- and off-street alternatives (as we have largely lowered rates in garages). These changes do not happen overnight. Several people have commented that, essentially, “demand-responsive pricing at meters won’t work because drivers will not know prices at different meters or garages”. We disagree. Not everyone needs to know about the differences in parking rates. To create more parking availability, we only need a few people to know about rate changes and choose to park somewhere else. Who knows about the differences in parking rates? At least some people, whether because they use an app to see rates (as well as availability), park so frequently in the same area that they are “experts” that end up noticing rate differences, or because people will generally start to realize that it now costs less to park in garages than on-street. It is still very early days and it takes time to learn and adjust. When evaluating the effects of parking pricing on parking demand, it is also important to recognize that parking demand is not constant. Many factors besides price influence parking demand, including seasonal variations (e.g., summer vs. fall), employment levels, and fuel prices. SFpark is a demonstration project, and we are gathering data that will enable a rigorous evaluation to better understand how price, as well as other factors, influence demand for parking. After a longer period (say, 18-24 months) of demand-responsive rate changes, we will all be in a better position to rigorously evaluate how demand-responsive pricing delivers benefits and changes parking, or travel, behavior. But it’s never too early to rock out to Primus. It’s impossible for a driver to make an economic decision based on this, since a driver has to park first, and then pay the meter. This scehem won’t work unless people choose not to pay the rate, and then get back in their cars and drive a few more blocks. Parking is too precious, people will pay whatever the machine says. People will learn over time and change their behavior. As a regular reader of Greater Greater Washington and resident of that fine District, it’s weird to see DC bloggers having such impact on SFMTA that they feel a need to respond immediately. Is SFMTA always this responsive to blogger concerns? I think they are more responsive to sf.streetsblog than dc.streetsblog, but the “story” did get picked up by several SF blogs (sfist comes to mind) so I’m glad they addressed it and were proactive. SFMTA has been much too reactive and not proactive in the past and the Chron and Examiner have jumped on them early and often on parking issues. Kudos to SFMTA for stepping up and stating their case right away. “Several people have commented that, essentially, “demand-responsive pricing at meters won’t work because drivers will not know prices at different meters or garages”. We disagree. Not everyone needs to know about the differences in parking rates. To create more parking availability, we only need a few people to know about rate changes and choose to park somewhere else. It is certainly true that no one can know the success of a project 18 months from now until those 18 months have passed. All we can really know are the current results and what they indicate about the current reality. But after giving it some thought, I take back my criticism of the SF Park program. With the program largely unknown and invisible to the average consumer, what will inevitably be required to produce the one open space per block will price escalation until price-sensitive drivers (who, unaware cheaper options exist, will assume all meters are equally expensive) choose not to drive at all. And this is the best possible outcome. In the end reducing the number of trips made by car will produce far less congestion than the original intentions of SF Park. I am not being sarcastic. Possibly the greatest good the city could do for the greatest number of people (in terms of economics, health, and quality of life) is to nudge them to be car-lite or even car-free. Gradually escalating street-parking prices will help people down this path. (Sinking medium incomes, gas prices, and cost of car ownership will also do their share of nudging.) It’s true some drivers may choose to drive to Colma or some other place with acres of free parking, but a sizable number of San Franciscans will decide to walk, bike or take Muni to their destination, or shop, exercise, do other business within walking or biking distance of their home instead. I only wish Trader Joe’s and Whole Foods were held to the same standard and had to institute variable parking prices that ensured one free space was always available in their lots at any hour of the day. Karen, I was appalled by SFPark’s lack of concern for citizens’ economic well-being. But I was not surprised by their disregard for the non-wealthy, price-sensitive citizen. We need informed, consumer-drivers. Concealing parking prices from the occasional driver to a specific neighborhood (like Zipcar users, tourists, local visitors from the Bay Area) disallows them from making rational parking choices. Choices that would help everyone — business owners, neighborhood residents, other drivers, and anyone wanting less pollution and congestion caused by circling. Instead we are rewarding the inveterate, all-the-time driver who is so committed to his or her worst choice mode that he/she studies the maps, downloads the apps, and chortles at working the system while suckers pay for his ongoing choice to driver early and often. Let’s let the market-based pricing really work. When the price of parking on each block results in a couple or more empty spaces in every block, we will have the desired results: less pollution, less congestion, and yes, less driving and more transit/walking, biking. With high enough parking prices and transit alternatives, we will get more people out of their cars. Yeah, they’ve been sticking it to Muni for years with under-priced parking and non-enforcement of bus only lanes. Mike, you are both well-informed and relentless in your passions. But in this case, why not address my argument? That is, that SFPark will work best when it truly embraces the experiment of market-based pricing of parking. I would love to see the whole concept applied to commercial and residential permit parking. I would love for this income generated to go to MUNI. But I think you and I might just agree on one thing: SFMTA is not all that sensitive to the financial stresses on all non-wealthy SF residents — be they long-suffering MUNI users or drivers kept in the dark about where to park and how much to pay. Mike only addressed the chuckle-worthy bit of your comment because the rest of it made no sense whatsoever. So, SFPark is failing in its mission because 18 months have gone by and in that time they haven’t figured out how to supersede state law and wrest every single commercial parking space out of the hands of the city and private property owners? Yeah, jeez Mike, while you’re at it please tell us why MacBooks and iPhones are expensive. Apple must hate working people. It’s as simple as this: if you’re a low-income driver and absolutely have to drive, there is now an option to find cheaper parking than ever existed before, if you’re willing to walk an extra block or two. Like coupons, thrift stores, etc., people will figure this out quick enough, if one or two dollars makes a difference to them. All the snark in the world is no substitute for rational debate of the issues. I am disappointed in the comments in reply to my original post. More important, I am disappointed that some commenters display so little regard to the high costs of living that Bay Area residents face. Transportation, however one gets around, is very costly for most people. And yet, the snarky know-it-alls sneer and toss off the comment that drivers will eventually learn where to park. Save us all from that snobbery and elitism. I guess I missed your original argument. You mentioned: “Let’s let the market-based pricing really work. When the price of parking on each block results in a couple or more empty spaces in every block, we will have the desired results”, but you offer no solutions how to do that. How is SFPark not meeting this goal? Short of huge blinking signs that display the price per block (this would only serve to further distract drivers). Also, SFPark is increasing the rate so slowly that the gap is pretty insignificant right now and people will adjust as time goes on. Yes, there may be a couple visitors, etc who end up getting stuck in a spot that is a bit more expensive (still won’t be that much more of a difference) but if “locals” end up finding a cheaper block then that usage will cause that cheaper block to no longer be cheap as the price will be adjusted. And the high cost of living in the Bay Area is an issue, and especially SF. But SF offers something that the rest of the area doesn’t, and that’s a high concentration of walkable neighborhoods. Just think if more of the bay area (or even the country) offered such amenities? There is a very limited supply of this sort of housing stock in the bay area and especially the country. Also, what if more housing (in SF for example) were able to decouple the parking from the living units? That’s $30-40k less per housing unit that each household could save, hence lowering the cost of ownership (or even renting). Now take the bay area as a whole, if we planned our cities better we could free households from “having” to own a vehicle (or at least multiple vehicles) and all the associated costs (hidden and known). So, really, in the scheme of things, raising parking on a few blocks a couple quarters per hour over the course of a year isn’t what is breaking the banks of “most people”. It’s the fact that, in order to feel like a functioning member of society, we force them to own and maintain a vehicle and those who can’t afford one, the real poor who are suffering from cheap under-priced parking, are sitting on the bus in traffic. The same traffic that is induced by free/cheap parking at nearly every end of nearly every trip. Seems to me that low income people who have to drive will learn about the changed rates. They generally drive to the same places – to work or to where they shop regularly – so they should figure out before too long where the cheap parking is in those locations. The ones who will not learn about the cheap rates are those who go somewhere once or at least infrequently. The main candidates I can think of are tourists and boutique shoppers going to a different shopping area for variety. Those people are not hurting for money. Icarus12: I don’t think you understand this issue at all. Please read the Shoupe book before you comment further. I recommend the tome for all. He likes parking. He thinks it necessary and valuable for a viable community; but he thinks it is cheap, or free, and there should be a reasonable price attached in order manage the demand. He doesn’t want to eliminate cars, trucks or parking. Thought I’d weigh in here: Although 68 percent of parking rates dropped or stayed the same in the first adjustment, and drivers in this city are very disproportionately wealthy, the cost of underpriced parking is already being paid by drivers in the form of circling (which includes gasoline, wear and tear, and lost productivity) as well as being imposed upon everyone else in terms of congestion, air pollution, increased distracted driving, unsustainable fuel consumption, and more. While subsidizing things like affordable housing and food stamps is very important, this is really not the same thing. The best thing the city can do to improve mobility for the residents who need it most is to improve Muni service and bicycling and walking conditions to increase access to the cheapest and most beneficial options. I see it difficult to argue that parking subsidies, which encourage driving, are a part of that picture, particularly when this city is one of the friendliest to car-free living in the country and driving is already so heavily subsidized in other ways (oil, roads, etc.). I’m not entirely up to speed on this scheme yet, but the rates are dictated by how many free spaces there are on the block, right? So even if you don’t know what the rate is going to be, shouldn’t it be clear that parking on a block with more open spaces will be cheaper? Jay rocks the Bieber bangs! One piece of data that should be available earlier is what has happened to the total revenue? Is SFPark managing to collect more money, if so I say it is working in at least one way. Many cities are having a very difficult time funding transit and road maintenance, ceasing to underprice parking is one way these budget gaps can be made up. 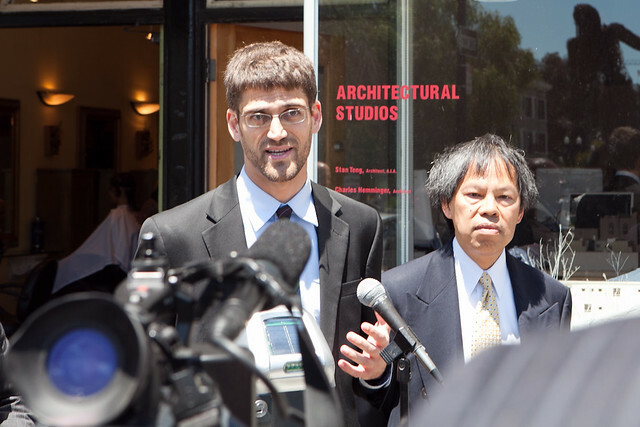 Jay Primus and the rest of the SFMTA are not listening to the residents!! SF Park is an EPIC FAILURE! SF Park came through my neighborhood in SOMA this and replaced 70% of the Residential (Y) Zone parking with meters. The end result is that residents can no longer park their cars in front of their homes. Here’s the best part. **NO ONE IS PARKING AT THE METERS** Near Townsend and 6th street. Residents on Bluxome Street now have to park our cars up to 4 blocks away. anyone catch the line “hours of meter operation might be expanded. It seems like you can park in front of your home–you just don’t want to pay to do so. Why not listen to RESIDENTS like me and just get rid of the parking. I don’t want to use my public space for your car.